In order for this project to be successful I have to be able to track where the balloon lands. A bonus would be if I were able to track its position live. In pursuit of that goal I studied for and obtained an amateur radio license in March of 2012. I haven’t gotten into the ham world too much. To be honest, it feels like stepping back in time. Before IRC and instant messaging we had radio waves. There’s a lot you can do with an amateur radio license outside of ragchewing. For instance, I make use of my license by using an APRS transmitter to update my balloons’ positions in real-time. This isn’t, however, a post about APRS or balloons. In fact, it’s not even a post about amateur radio in the sense that I don’t need a license to do what I’m about to discuss. Above our heads at all times there are many satellites orbiting our planet. They all serve or did serve some purpose. Some of those satellites are operated by NOAA and are used to watch the weather patterns on Earth. 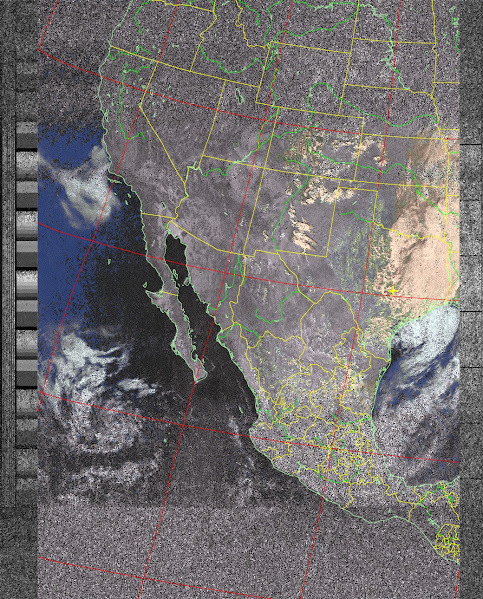 Many of the NOAA satellites transmit images of what they see using a system called Automatic Picture Transmission. They broadcast on the 137 mHz band and there are currently 4 that still broadcast APT data. In September of 2012 I built an antenna to attempt to use my radio as a receiver of these images. You can check out some of the stages of the build process in the album below. The signal coming from one of these satellites is circularly polarized, which is what this antenna is built to receive. It’s not the greatest build, but it is serviceable. 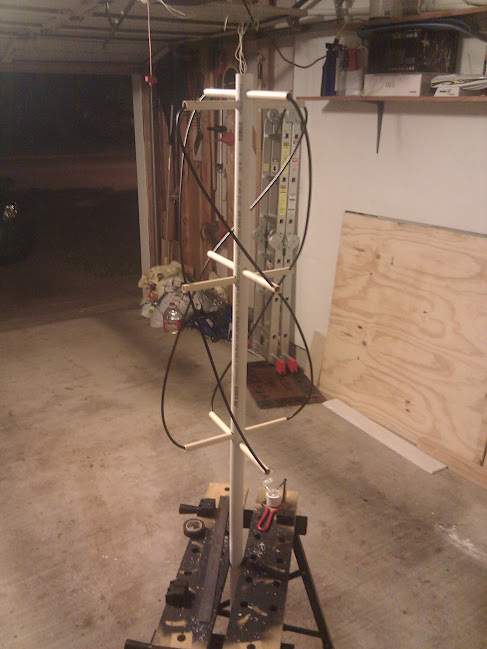 This antenna is supposed to have good omnidirectional coverage from the ground up from horizon to horizon. In practice, my build doesn’t fare so well. I mounted the antenna in my attic and used a SDR (Software Defined Radio) setup that I have to track down the satellite signals. As I stated before, this antenna doesn’t perform extremely well. I was, however, able to get some halfway recognizable images out of it. Without further ado, here they are. I remember doing the same in the 80’s at school, but we didn’t have such a cool antenna, the results were recorded onto a casette tape and pumped into a BBC micro with good knows what awful video resolution. Needless to say, your image is much better 🙂 Thanks for a cool article and bringing back some memories! Thanks for reading it and taking the time to comment. This was definitely a fun project.